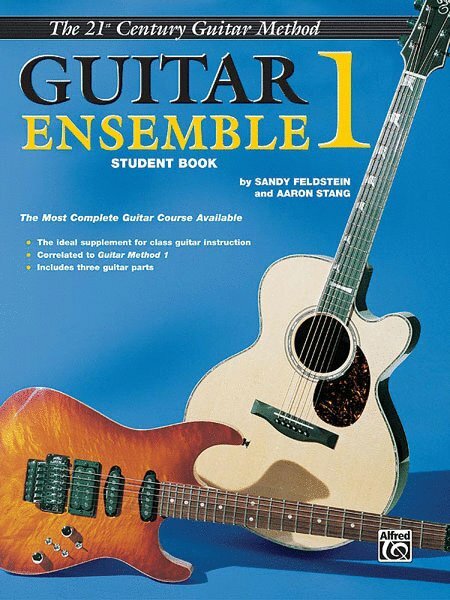 The Guitar Ensemble books provide the ideal supplement for class guitar instruction. Correlated by page to the Guitar Method, the score book includes three guitar parts in score form with optional piano, bass, drums plus an accompaniment recording as well as suggestions for the teacher. The ensemble student book includes three guitar parts which are musical and easily playable. It provides an immediate performance outlet for even the beginning guitar class. Book 1 is correlated to Guitar Method 1. Titles: Love Somebody * When the Saints Go Marching In * Down in the Valley * Variations on Old Saint Nick * Dona Nobis Pacem * Blue Rock * Bach Minuet * Blue Moon and more. [SPANISH] Correlativo a Guitarra Método. El suplemento ideal para la clase de guitarra. Incluye tre partes para guitarra. Partitura (opcional) incluye tres partes para guitarra, piano, bajo, batería y grabación del acompañamento.